Published: Nov. 26, 2008 at 06:46 p.m. Extra effort has helped the diminutive Lance Moore make his mark in the NFL. Fresh off New Orleans capping an NFL-record week for scoring (837 points) with a 51-29 victory over Green Bay on Monday night, the Saints acknowledged the possibility of running back Reggie Bush returning from a knee injury for Sunday's make-or-break game at NFC South-leading Tampa Bay. In N'Awlins vernacular, ain't nothing like adding a little more spice to some already-zesty gumbo. The return of Bush, one of the NFL's most versatile game-changing offensive threats, could give New Orleans (6-5) that little extra it needs to rally from the bottom of the division into the playoffs, a locale that seemed certain before early-season injuries charted a course of inconsistency. Yet Bush may now be more of a complementary player to a crew of role players that have emerged to help quarterback Drew Brees and the Saints remain competitive. Running back Pierre Thomas and wide receiver Lance Moore, players whose mere existence in the NFL is based on the need to impress every week, made up for Bush's absence -- and more. 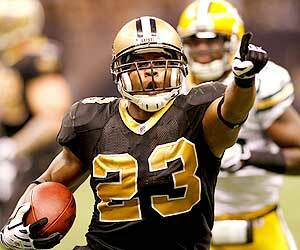 Pierre Thomas scored two touchdowns in the Saints' 51-29 win over the Packers on Monday night. Thomas, undrafted out of Illinois last season even though he started over 2008 first-round pick Rashard Mendenhall, provided the dual run-receiving threat Bush did, totaling 265 yards from the line of scrimmage and scoring three touchdowns. For the season, he has 325 yards and six touchdowns on 67 carries. Moore, an undrafted player who spent time in NFL Europa and on the Saints' practice squad over the past three seasons, is New Orleans' leading receiver (57 receptions, 724 yards, seven touchdowns) and has posted career games the past two weeks, scoring four touchdowns in the process. His five-catch, 115-yard performance against the Packers included a 70-yard touchdown, which was mainly of his own doing and proved, as coach Sean Payton said in training camp, that "he's at a point in his career where he's past the (undrafted) free agent-Toledo-NFL Europe tags." "We've got a lot of guys capable of making plays," said Moore. "With injuries and things like that other guys have had to step up, myself being one of those guys. I always felt I had the ability and talent but it was a matter of time for me to wait to get that opportunity. And when it came, I had to make something of it." The diminutive Moore (5-foot-9, 190 pounds) stepped up and made himself the top target for NFL-leading passer Drew Brees when Pro Bowl wideout Marques Colston sustained a thumb injury that kept him out for five games. He also made up some slack when tight end Jeremy Shockey missed three games with a sports hernia. With Thomas and Moore proving themselves, their roles might not decrease with more and more players getting healthy. Instead, they're additional weaponry for an explosive offense defenses have already struggled to decipher. "He's not a secret anymore," Buccaneers coach Jon Gruden told the New Orleans media this week. "He's caught a lot of balls down there. He's obviously a very reliable guy, and to me that's the key for the Saints. Drew Brees puts them into good plays. To have a guy like Moore ... that is a double-edged sword for a defense." With the imposing Colston, speedy Devery Henderson, Shockey and Moore, the Saints have a diverse receiving corps that could get a jolt with the infusion of Bush (42 receptions, 366 yards, three touchdowns). That's where Thomas comes into play. Payton would prefer to ease Bush back into the mix, and by keeping him out of harm's way in the slot, Bush could be used more as a receiver or an in-motion runner or an option in a Wildcat-like formation. Using Thomas (who has averaged 5.5 yards per carry in the three games he's received at least 10 carries) as the backup to Deuce McAllister could allow the crafty Payton to use Bush in ways where he won't take a pounding. Thomas also is similar in stature (5-11, 215) and in receiving ability to Bush (6-0, 203) and there are times both could be used in the backfield together, forcing defensive coordinators to decide between playing nickel or base sets, which the cerebral Brees could exploit if the opposing staff guesses wrong. While McAllister was held out of the opener against Tampa Bay to get in optimal condition following knee surgery, Bush and Thomas were the main running backs. They combined for 103 rushing yards, 10 catches for 123 yards and a touchdown. The rising fortunes of Thomas also could not come at a more important time for the Saints. McAllister is facing a possible four-game suspension for violation of the NFL's banned-substance policy. His case is under appeal, but if McAllister can't play, Thomas has shown he is trustworthy as a starter or a backup to Bush. "He is a smaller guy but he's a physical runner and he breaks a whole bunch of tackles," Moore said of Thomas. "He's done nothing but make big plays for us." Thomas, who was primarily a kick returner as a rookie, also is hungry, which at this point of any season, is something all teams, let alone a desperate team, needs. "In college, me and Rashard (Mendenhall) battled for playing time and the coaches saw I have a lot of desire, like I have now," Thomas said. "I am trying to make sure that we don't miss a beat. I've been trying to show coaches that I can get the job done and I hope I've been showing that. (Payton) does seem to show faith in me and so have my teammates." Coinciding with Moore and Thomas peaking the past two weeks: The Saints' only winning streak of the season. "We feel good," said Thomas. "We felt like we played a good game and in every phase (against Green Bay), and we've got to continue that. We have to stay focused because we've got a tough game coming up." New Orleans (6-5) is at the point where every one of its remaining five games is a must-win. A victory over the Buccaneers (8-3), who the Saints defeated, 24-20, in the season opener, would give New Orleans its first three-game winning streak since stacking four straight in Weeks 11-14 of last season. "It's all about putting ourselves in position to have a chance," Moore said. "We've lost a lot more games than we wanted to but we still have that chance to make it. Everyone has to step up and play each game like it's the most important game we have." It's a philosophy Moore and Thomas hope they've shown the rest of the team. It's their credo to have gotten where they have -- and to where they could go.